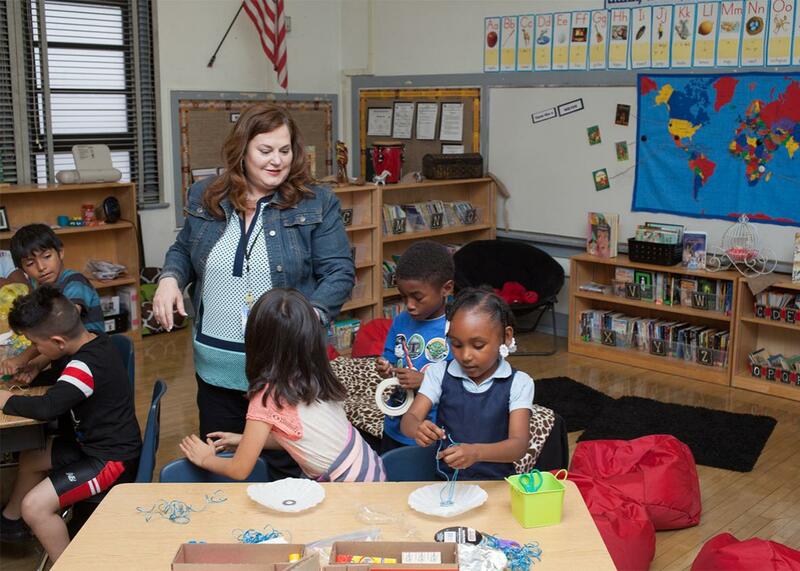 Amy Davis teaches a second-grade class about parachutes at Manchester Avenue Elementary School. 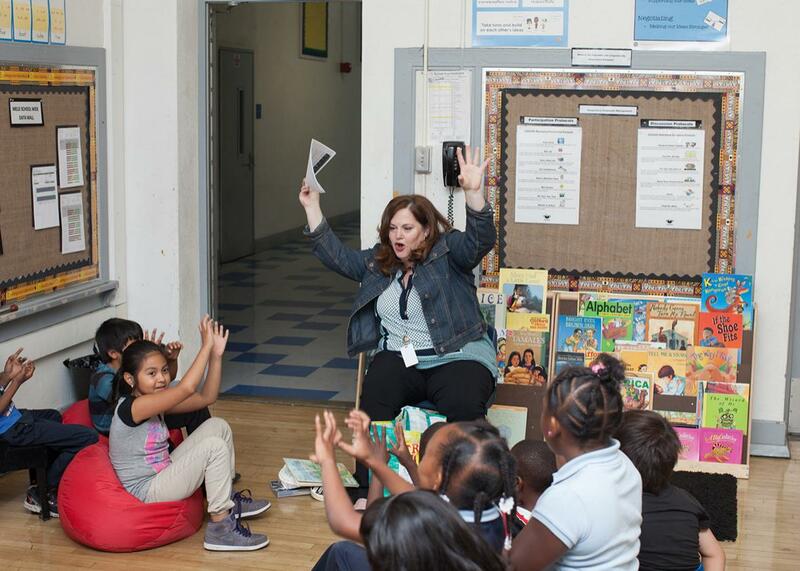 LOS ANGELES—When she began teaching a class of second-graders in South Los Angeles in 2002, Amy Davis expected she’d occasionally hit snags with issues like lesson planning. But she figured she’d have little trouble relating to her mostly low-income black and Latino students. After all, she was raised nearby, in a household headed by a single mother who for years survived on welfare and food stamps. Like her students, Davis knew what it was like to grow up poor. But Davis, who is white, struggled to connect with several of the children—particularly a 7-year-old black student named Patrick. If Patrick came to school in good spirits, Davis’ day generally went smoothly. But if he showed up in a sullen or angry mood, Davis knew there was a good chance he would derail her plans for the class. She couldn’t control his meltdowns, which could be triggered by both his classmates and his schoolwork. On those days, she’d often end up crying throughout the car ride home. It took months of worrying, and the advice of a veteran colleague in the classroom next door, for Davis to have an epiphany: Despite her own experiences as a child, she was now, unlike her students, a firmly established member of the middle class. The leap from economic insecurity to stability had created an inevitable chasm. Davis, now 48, marks that moment as the beginning of her efforts to become a more “culturally competent” teacher, someone who strives to understand where her students are coming from—literally and metaphorically. In the most basic terms, Davis represents the quintessential American teacher: white, middle-class, female. But where Davis approaches teaching as a social-justice mission, and has painstakingly worked to build influential relationships with her students, countless other well-intentioned educators never succeed in forging similar bonds. Yet they are charged with changing lives and boosting test scores in some of the nation’s poorest and most struggling schools. It’s a disconnect that’s raising alarms for educators and parents alike at a time when minority children now account for more than half of all students in public schools and the teacher workforce remains more than 80 percent white. And so teacher-training programs are increasingly trying to figure out how to bridge this divide. The goal is to help make teachers more aware of their own biases and enable them to understand more fully their students’ lives outside of the classroom. 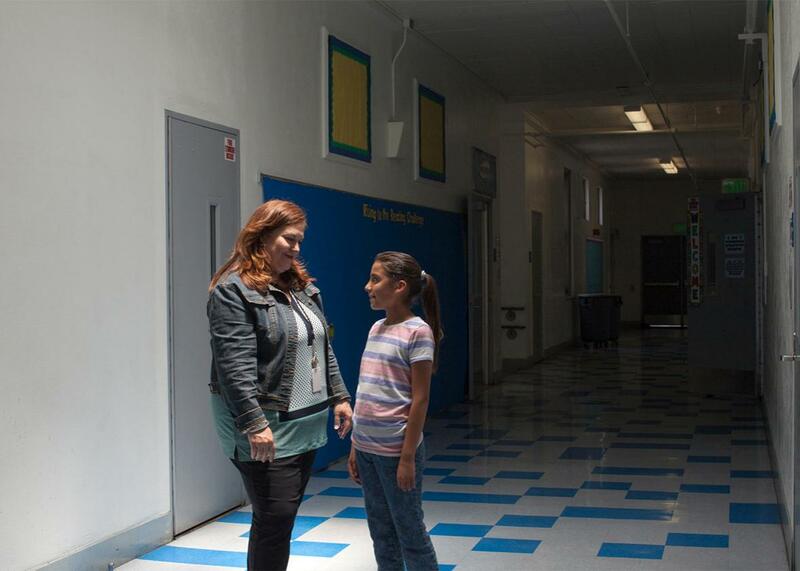 Davis speaks with a student named Jocelyn, whom she has taught reading since August 2015. In recent years, training programs focused on cultural competency have proliferated. Davis’ alma mater, University of California, Los Angeles’ Graduate School of Education and Information Studies, created the Center X in 1992 following the Los Angeles riots, with the mission of transforming teachers into “social justice educators in urban settings.” And newly certified teachers heading into the Houston Independent School District, where more than 60 percent of teachers are white (while nearly 70 percent of students are not) are now automatically enrolled in a series of courses designed to help them address the diverse needs of the city’s public school students. Among the topics covered are how-tos for effective communication between schools and families and guided instruction on addressing misunderstanding in the classroom. Teach for America also launched a pilot program, Education for Justice, that helped college seniors interested in teaching learn more about culturally relevant instruction—though the organization recently ended the pilot as part of a broader reorganization. Becoming a culturally competent white teacher means a lot more than setting a few Shakespeare sonnets to a hip-hop beat. It certainly takes more than a plucky attitude and tireless will to buck the system, the way we often see it depicted in movies featuring attractive white educators who swoop into rough low-income neighborhoods and save their hard-to-reach students, like Michelle Pfeiffer in Dangerous Minds. When pursued with genuine commitment, it’s really about removing the white, middle-class lens through which brown and black children are often judged. While these programs vary in focus and duration—they can range from several weeks to two years—they all focus on producing educators with an awareness of personal and institutional biases, and a willingness to immerse themselves in the communities where they will work. For instance, Teach for America’s Education for Justice program included a yearlong virtual course. Students were asked to shadow a student for a day, interview a parent, and plan and deliver a “culturally relevant” lesson that was recorded and analyzed. The purpose of the exercises was to provide “authentic and humanizing interactions” that help prepare college seniors of all backgrounds for the diversity of the classroom, says Jamie Jenkins, former managing director of pre-corps development for TFA. Despite recently eliminating several high-level positions, including TFA’s chief diversity officer and 15 percent of its national staff, TFA is designing a three-year plan to scale up the lessons learned through Education for Justice, which, until this year, reached only about 1 percent of corps members. Davis reading to her second-grade students. One mistake white teachers often make is conflating culture or race with social class, says Ladson-Billings. Several years ago, a student teacher made the observation that most of her students came from single-parent households—calling that a common phenomenon within “black culture.” Ladson-Billings calmly corrected her, explaining that single-parent households became much more common among poor black families in the 1960s, after the federal government revised the Aid to Families with Dependent Children program—the chief instrument of welfare—to exclude two-parent households from receiving financial assistance. “I was able to change that young teacher’s mind in one conversation—probably something she believed her whole life,” Ladson-Billings says. The University of Wisconsin is one of a number of programs that weaves social policy history into its teacher-training coursework. That means teaching how housing policies have helped shape public school systems since the beginning of the 20th century and how racial segregation has lingered in school systems. While her trainees appear to understand the damaging effects of that attitude toward children of color, Ladson-Billings encourages young teachers to treat their newfound wisdom like a delicate plant requiring ample nurturing and care. “What I do is just plant the seed. It’s up to them to continue to care for it,” she says. 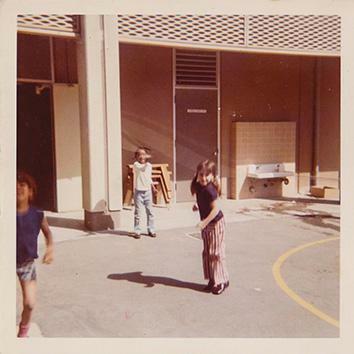 When she was 3, Davis and her mother moved from New Orleans to South Central L.A. They lived on welfare and food stamps for several years until her mother went back to school and earned a bachelor’s degree. After her mother landed an administrative job with the school district, they made the leap from “poor to kind of middle-class,” says Davis. Davis during her elementary school years in South Central L.A.
Only a few months into the school year, Davis begged her mother to enroll her in private school—by then a financial possibility. That set her on a path to Mount St. Mary’s, a women’s college in L.A.’s tony Brentwood neighborhood. As a college student, Davis began working for a telecommunications company, rising through the ranks from a part-time customer service representative in her teens to an executive in her early 30s. By then, she owned a modest two-bedroom house in a mostly white suburb of L.A. In her early 20s, one of Davis’s bosses, an older white woman, had told her to “stop talking like a black girl,” so she resolved to start “talking white,” she says. It wasn’t so much what she said but how she said it. The cadence of Davis’s speech still followed the patterns of African American Vernacular, which she’d picked up as a child. She would often drop the hard consonant sounds at the end of words. So spent became spen. Without explicitly saying so, Davis’ boss sent an old but familiar message: Sounding black is bad. Although at the time she was a little ashamed and hurt, Davis now views the experience as an early lesson in how not to be culturally competent: stating or implying that someone’s language, race, or culture are somehow wrong. And as fond as she is of her old boss, Davis is certain that none of her black colleagues were encouraged to change their speech—nor were they offered the same professional opportunities. “I had doors opened for me even when I didn’t have as much experience as my African American counterparts,” Davis says. After 15 years, Davis left the corporate world when her company asked her to relocate to Chicago. A single mother with a son on the cusp of high school, she was daunted by the upheaval of moving to a new city. She decided to become a teacher. In the late 1990s, the Los Angeles school district faced a severe teacher shortage. Anyone with a bachelor’s degree could teach with an emergency credential or proof of enrollment in a teacher-training program. Davis applied to UCLA’s teacher credentialing program. Six weeks later, she found herself back in South L.A., a few miles from her childhood home, underprepared and standing in front of a room full of second-graders. Davis in an alley near her childhood home in South Central L.A.
After struggles with students like Patrick forced Davis to recognize her relative economic security and racial privilege, she began devoting much more time to understanding the home lives of her students. She stopped taking it for granted that most of the children got a good night’s sleep, had their own beds to sleep in, and ate enough before arriving at school. With Patrick, she began scheduling regular phone calls with his mother. “I had to cultivate that relationship, but when he found out we talked almost once a week, he started changing his behavior,” Davis says. It took Davis at least three years of teaching in South L.A. before she began to feel truly confident in her relationships with her students and their families. She sought advice from veteran mentor teachers and signed up for as many professional development sessions as she could fit into her schedule. She learned to scour catalogs for books featuring black American and Latino protagonists that looked like her students. She adopted classroom management techniques that didn’t disproportionately single out black boys, an unfair but common practice in urban schools. And she figured out how to talk to her students about the beauty and linguistic variations of the language they spoke at home—usually African American Vernacular—and the importance of being able to switch into standard English when necessary. Although Davis was able to become a more culturally sensitive educator over time, other teachers struggle to make that transition even with specialized training and support. About 17 percent of teachers nationally leave the profession altogether at the four-year mark. While those who leave cite a wide range of working conditions for doing so including a lack of mentorship, teachers in high-poverty schools are more likely to depart during the first year than those in lower-poverty schools. In an attempt to remedy that problem, school districts across the nation offer professional development training focusing on culturally relevant teaching techniques. If progress has been slow with teaching cultural competency, Sally Campbell Galman, a professor at the University of Massachusetts, Amherst’s College of Education, says part of the problem is that so many teacher trainers are older, white academics who are uneasy facilitating conversations about race. Galman adds that in an era of Common Core and standardized testing, too few programs allocate much time for training teachers in cultural competence. The vast majority of educators still have to figure it out on the job. Davis meeting with Marisol Ceniseros and Michael Ceniseros during a parent-teacher conference. Today, 14 years after she became a teacher, Davis helps other teachers become more culturally competent with their students within Manchester Avenue Elementary, where she’s been for the last three years. In her new coaching role at the school, Davis focuses on helping educators engage with students who struggle most with the English language. Her official title is “standard English language coach,” a new position that the Los Angeles school district is trying out in 10 schools with high numbers of black and Latino students who have a hard time mastering academic English. The end results of Davis’ efforts were apparent one Friday in late February, when she met with two teachers. Huddled around a low bean-shaped table in chairs built for kids half their size, Davis reported that many of the school’s most struggling readers had made measurable improvements. She had the spreadsheets in hand to back her up. But one boy, J.J., had not made much progress. When she came to the subject of J.J., Davis chewed her lip—a habit when she presents worrisome news. J.J., a third-grader who should be able to read words fluently this late in the school year, still grappled with blending sounds together. It was a step back for the boy, who had been making progress before the winter break. “I’m also concerned that some of that could be what’s going on at home with him,” said Davis. Although Davis is no longer at the helm of her own class, she continues to be intimately familiar with the ins and outs of student’s lives and remains in close contact with many of their parents, including J.J.’s. The three women discussed what to do next, eventually agreeing to transfer J.J. to a younger group—one that was still working on blending words. Davis promised she’d pull him aside before the end of the day to tell him about the change—“so he understands why it’s happening.” Any type of instability or disruption in routine is a trigger for J.J., she explained. Davis hugs Michael Ceniseros at dismissal time. To an outsider it may appear an obvious step to take, but teachers commonly fail to communicate with parents and students about why they do what they do. By looping J.J. and his parents into the process, Davis hopes to build trust and accountability on all sides. If there is a secret sauce to becoming a culturally competent teacher—white or not—Davis says it is time. Throughout those early years, she spent upwards of 13 hours a day on the job. When she scheduled parent-teacher conferences and only a handful of parents showed up, she made arrangements to meet them at fast-food restaurants at night or on the weekends. When students invited her to church choir recitals or local soccer league games, she made it a point to show up with flowers or orange slices. When kids confessed they had no books at home, she scrounged for sales at nearby bookstores. “I do think maybe white, middle-class teachers have a hard time because they don’t know what it’s like to live in poor communities, but it’s not impossible,” she says, adding that too many teachers abandon the profession before figuring it out.